Although the AG Urodela is associated with the DGHT (German Society for Herpetology and Reptile/Amphibian Husbandry) a lot of enthusiasts from all over the world and especially Europe are members and participate in the activities of this Work Group. Therefore, also the newt registry for the genus Cynops should be regarded as an international and especially Pan-European endeavour. 1. The conservation of rare and endangered species by captive breeding. 2. The coordinated exchange of animals, respectively their offspring between registry members (studbook) and thus the reduction of collection of animals in their natural habitats and imports. 3. The issue- and species-related counselling of beginners as well as advancers by the registry tutors. 4. Engrossing of knowledge on species biology through captive keeping and breeding. 5. Provision of captive bred animals for potential restoration projects. 6. The compilation of species-specific literature. 7. The compilation of a picture archive for this genus. The genus Cynops comprises seven currently recognized species. 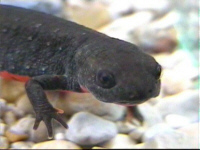 The animals belonging to Cynops are small to medium sized newts, which spend significant periods of their life-cycle in the water. Two species - C. pyrrhogaster and C. ensicauda - occur on the Japanese islands whereas five – C. orientalis, C. cyanurus, C. wolterstorffi, C. orphicus and C. chenggongensis – can be found on the Chinese mainland. 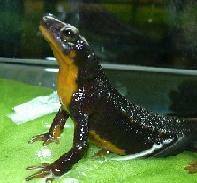 Newts of this genus are commonly known as „Firebellied Newts“ and have been popular among enthusiasts for decades. In the past, C. pyrrhogaster, the Japanese Firebellied Newt, used to be the only species that was imported in Europe and North America. Because of legal restrictions, this species has been replaced by the Chinese Dwarf- or Firebellied Newt - C. orientalis in recent years. Currently there are two more Cynops species kept by European enthusiasts. C. ensicauda the Sword-Tailed Newt from the Southern Japanese Riu-Kiu archipelago and the Kweichow-Firebellied Newt - C. cyanurus, ocurring in the highlands of the Chinese province of Guizhou. The situation within the genus Cynops in Europe differs significantly for particular species and thus different species-specific focal points are adressed in the registry work. Cynops orientalis is the only species, which is still being imported in masses with the animals usually being in a terrible condition. There is sufficient captive breeding in Europe, which renders further imports of wildcaught animals unnecessary. First objective of the registry must therefore be the dissemination of information on these facts and to provide an alternative to imports by supplying captive bred offspring, which is usually longer-lived and healthier. The situation for the two subspecies of Cynops ensicauda is quite different. Whereas C.e. popei is bred regularly, only few reproductive groups of C.e.ensicauda exist in Europe. The main goal for this subspecies must therefore be the establishment of additional breeding groups. Since either of the subspecies are no longer exported from Japan, captive breeding attains an even greater importance nowadays. The situation for Cynops pyrrhogaster seems to be rather complex. Years ago, this species was imported in large numbers, but nowadays it has become quite rare in captivity. The systematics of the pyrrhogaster-complex are still uncertain and at least five local forms have been described in literature with the different animals presumably having the status of subspecies. The form most commonly bred in captivity is sasayamae and some few groups of the Hiroshima-form exist. The other forms are encountered only rarely and the establishment of additional breeding groups is planned. Because of the high variabilty in appearance of this species, the assignment of individuals to specific forms respectively populations proves to be quite difficult. Cynops cyanurus is bred occasionally in European aquariums. The two subspecies C.c. cyanurus and C.c. yunnanensis have been described. The differentiation of these subspecies still poses a problem and thus the groups in the registry cannot be assigned to either one. A problem still to be solved. Cynops orphicus does not occur in private terrariums. Cynops chenggongensis most probably is and has not been kept in captivity anywhere. For these two rare species mentioned above, the establishment of stable breeding groups in captivity could help to avoid the risk of complete extinction caused by the depletion of natural habitats. Cynops wolterstorffi is presumably extinct already. An excursion to the natural habitat for the confirmation would be very much desirable. If remnant populations or animals could be ascertained, conservation measures like the establishment of nature reserves had to be put into effect. Experienced breeders could also engage in a breeding program for restoration purposes of this species. Anybody keeping one or more Cynops species is invited to participate in the registry. The participants are informed about the status of the registry, appropriate literature, breeding success and everything else being of interest for the keepers of Cynops newts; the exchange of animals as well as information between participants is supported. Registry members have access to the registry’s bibliography as well as the picture archive, the latter being still under construction. Everybody is invited to make suggestions concerning the registry.